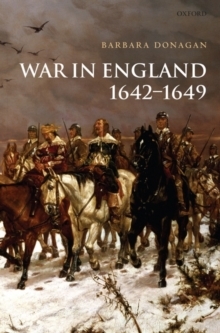 A fresh approach to the English civil war, War in England 1642-1649 focuses on answering a misleadingly simple question: what kind of war was it to live through? Eschewing descriptions of specific battles or analyses of political and religious developments, Barbara Donagan examines the 'texture' of war, addressing questions such as: what did Englishmen and women believe about war and know about its practice before 1642? What were the conditions in which asoldier fought - for example, how efficient was his musket (not very), and how did he know where he was going (much depended on the reliability of scouts and spies)? What were the rules that were supposed to govern conduct in war, and how were they enforced (by a combination of professional peer pressure andsevere but discretionary army discipline and courts martial)? What were the officers and men of the armies like, and how well did they fight?The book deals even-handedly with royalists and parliamentarians, examining how much they had in common, as well as discussing the points on which they differed. It looks at the intimacy of this often uncivil war, in which enemies fought at close quarters, spoke the same language and had often been acquainted before the war began, just as they had often known the civilians who suffered their presence. A final section on two sieges illustrates these themes in practice over extended periods, andalso demonstrates the integration of military and civilian experience in a civil war. Drawing extensively on primary sources, Donagan's study illuminates the human cost of war and its effect on society, both in our own day as well as in the seventeenth century.